One of the most prolific and engaging stand-ups of our time. 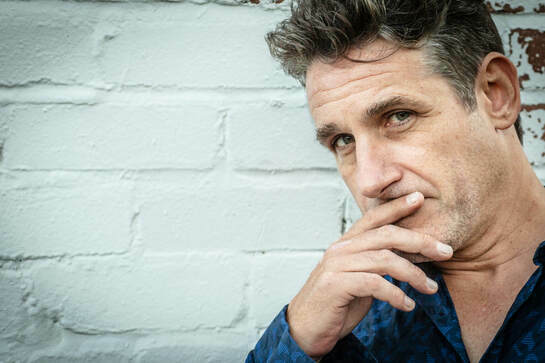 Tom Stade has appeared on our televisions in Ch4’s Comedy Gala, BBC One’s Michael McIntyre’s Comedy Roadshow, The John Bishop Show and Live at the Apollo. In fact Tom Stade, has been around for quite some time with this year being the 30 year anniversary of his stand up comedy career. Following last year’s smash-hit UK tour, the Canadian comedy legend is back on the road with a brand-new show. ‘I SWEAR TO…’ which is picking up just where it left off, as according to Tom, an hour simply wasn’t long enough. Direct from the Edinburgh Festival, Tom attempts to figure out exactly where he fits into this emerging new world of feelings and FaceTime. When did he, and all his stuff become vintage - and why didn’t he see it coming? Armed with his usual swagger and playful sense of mischief, I chat to Tom as he explores these generational conundrums, and a whole lot more. So just what will Tom be delighting his audiences (which include his loyal fans, known as the Stadinese Army) with, this time around. “Times are a changing,” he continues philosophically, in that familiar husky voiced Canadian drawl, “and the fact is that I was there when times were a changing for me, when I was in my 20s, hassling old men 'cos they were dumb." Does he feel that he’s older and wiser now then? He replies, “My world is slowly diminishing, that world is being taken away from me - I can look at it as that, or I can flow with this river that I don’t really agree with,” he reasons. Tom clearly doesn’t have a stoner reputation for nothing. I ask him how the ‘flowing’ is going? I interviewed Tom a couple of years ago before his last tour. We're around the same age and his kids, Kira and Mason, are the same age as mine, so a lot of what he talked about in his last show rang scarily yet hilariously true. I can't wait to find out how the next chapter plays out in this new tour. “I’m trying not to be the ‘parent’”, is the answer. “What the whole thing of ‘I Swear To’ is, is that my kids are done; they’ve all moved out of the house now.” How the hell did he manage that? It’s just as well then that Tom is playing sell-out shows, although you definitely get the sense that Tom is in his element performing stand up. “I love it. I'm sitting here writing the new show while I’m doing this show and I’ve just been laughing at myself. Like this year right now, 2019 will be my 30th anniversary of being in comedy, so obviously I love it." When Tom isn’t doing stand up, he can often be found at a concert or two, Country 2 Country, Snow Patrol and Pearl Jam have been a few recent ones and you kind of get the impression that Tom would be right at home living the rock star lifestyle himself; not least because for this tour he has introduced to the merch stand an exclusive 30 year anniversary Tom Stade long sleeve t-shirt. [hint] I really want one. “They’re awesome,” Tom proudly tells me. “I was like, you know what, comedians don’t have that. You don’t have a Russell Howard shirt do ya? Are you walking around with a Kevin Bridges shirt? I tell you what you are walking around with - a Tom Stade t-shirt!” So I’m gonna play it like we’re rock stars and do all the things they do - you know what I mean?” Oh, I do. Tom has recently been involved in a BBC Scotland film, The Grey Area. I ask him how he got to be a part of the hard hitting drama which tells the story of a young rapper struggling to overcome the consequences of drugs and gang violence. The tv film includes cast of real life ex-offenders, addicts and dealers in Edinburgh. “HUGE PRESENCE. REALLY KNOWS HOW TO WORK A ROOM. ATTITUDE AND ENERGY. “SO COOL HE COULD WELL BE THE ANSWER TO GLOBAL WARMING.